The Military College of South Carolina is located in Charleston. It was established in 1842 as a military academy by the State Legislature of South Carolina. Today, as in the first half of the 20th century, members of the 2,100 strong Corps of Cadets continue to wear uniforms, follow a military regimen, and adhere to a strict honor code while pursuing a four year bachelor’s degree study. 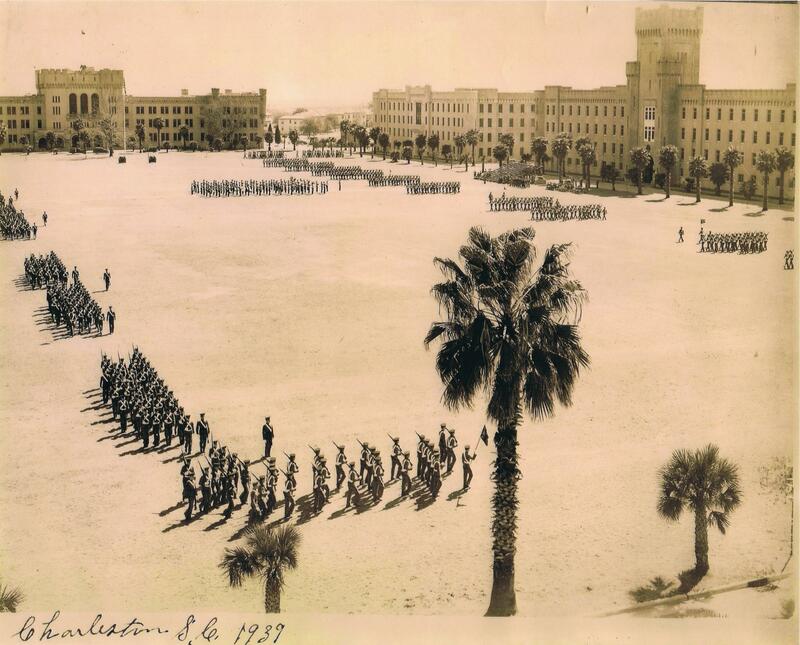 The South Carolina Corps of Cadets on parade at The Citadel, 1939. Photo courtesy of The Citadel Archives and Museum, Charleston, South Carolina. Over the past few decades, approximately 1/3 of the Corps has entered military service upon graduation. In comparison, during World War II, the entire Class of 1944, known as “the class that never was“, was called up their junior (3rd) year to serve. Thirty-four members the Class of 1944 died in the war of which nine rest in peace, and another’s name is inscribed on Tablets of the Missing, in American Cemeteries is Europe. During World War I, nine Citadel lost their lives in Europe, and during World War II, two hundred and seventy-nine Citadel Men died or were missing-in-action while in the service of their country and its allies. In fifteen American and Commonwealth cemeteries in Europe and North Africa, forty-four of these men rest in peace, and the names of another seven are inscribed on Tablets of the Missing. In the In Memoriam section of this website, where available, you find the faces and stories belonging to the fifty-four names etched into stone for all eternity. “Almighty God, the source of light and strength…” This prayer was composed in the midst of the Second War World for The Citadel’s Centennial by Bishop Albert S. Thomas, First Honor Graduate, Class of 1892. Since then, it has been memorized and recited from the heart by every cadet. Go to page. Its history and words researched by Steve Smith, ’84. “Oh, Citadel, we sing thy fame…” Go to page.